This isn’t the first time I have interviewed John Rampton. We go waaay back. Right, John? Seriously though, in all of the times that I have crossed paths with John, whether it is an interview or a conference, or simply intersecting on the world wide web, I am always impressed by his personable way of working with people. Hey, he is a likable guy! But, that isn’t all there is to John Rampton. He is very insightful, as well. So, when John Rampton was featured in entrepreneur.com, I couldn’t help but take notice. Here are some interesting news articles about John Rampton, that caught my attention. 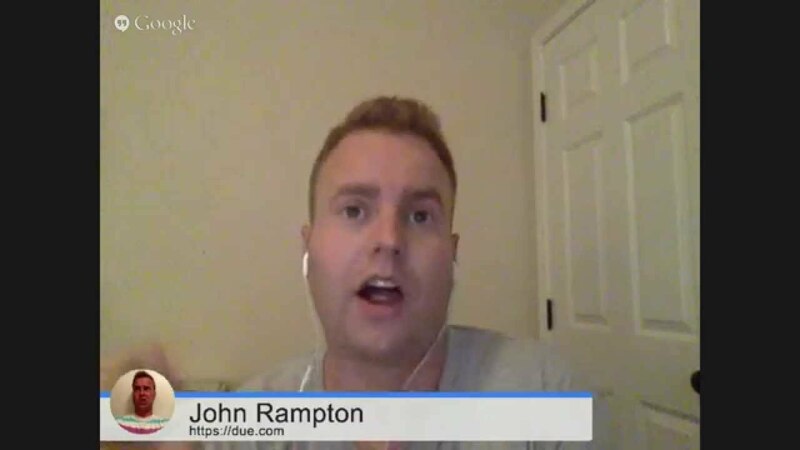 Entrepreneur John Rampton Acquires Due.com for $130,000: An Exclusive Interview. After I saw these, I had to contact John and ask him what the deal was, with Due.com and this very public investment. I asked him if I could feature him, as one of the “people behind the brand,” for WebToolsTV.com. Here is that recent interview. Interestingly, he is also an author on the Intuit (Quickbooks, Quicken, Turbotax Products) blog. Is that a competing product? (More, below). Either way, John knows money, writing, and how to serve those needing financial tools (isn’t that everybody?). Murray is another one with whom I have crossed paths quite a few times. He is a very talented videographer and interviewer, himself, so we share a lot of common interests. He is also the other half of the Due.com founding team. (Murray, why haven’t we done the interview thing, yet?) Go do an internet search for “Murray Newlands,” and you will find a whole list of impressive achievements. I have been a user of Quickbooks for longer than I want to admit. I am also a fan of PayPal Business. So, when John Rampton described Due.com to me, it seemed like a better solution than anything I have seen. I am already familiar with John’s other endeavors, sites, training, etc. So, I know that what he produces is quality. The same goes for Murray, who has an eye for the ingenious. I guess until I interviewed him, I thought Due.com was just a domain. However, this is serious stuff. Due.com takes the best of all the worlds I already love and use (i.e. QuickBooks, PayPal) and makes it fun and functional! Many of us, here on the Internet, are entrepreneurs. As entrepreneurs, we handle our own bookkeeping. It is not uncommon for the bookkeeping tasks to take longer than it should. Also, if you are billing for a small project, but the billing itself takes longer to process, then you are not making as much as you should, as far as profit margin. The feature list for Due.com includes tools that go beyond just the money side of things, with calendars, time trackers, reporting, intuitive dashboard, and project management tools. I noticed that it appears to be a BaseCamp code base. BaseCamp, as many of you know, is a project management tool. It is very popular as a code base, as well, having been used in the development of the popular project management tool, Teamwork.com, as well. Rather than taking my word for it, you can sign up for the “always free” plan and try out some of these features for yourself. You don’t have to feel like you have to give up on your current way of doing things. You are able to try out the service without a long-term marriage to the product. That said, the ease of use that includes the PDF functionality (have you ever tried to create that in QuickBooks?) and PayPal integration is very appealing, indeed. The time savings alone is an easy payback for a simple investment of $10/mo. Business help for the busy entrepreneur… Just another way that we, here at DirJournal, look out for you, our readers. Great interviews. Due.com does seem like it will be a great service for small businesses! John shared some great insights into making sure you get paid promptly in the last video. Putting an exact date on an invoice instead of “due in 15 days” or “due in 30 days” is an excellent idea. I also found his comments about invoices dropping so much in Greece really interesting. Thanks, Gail. I appreciate the feedback. And, yes, I found that Greece info interesting, as well. It shows that John keeps and ear (and eye) out for what is going on in the industry, providing that much more credibility for what they are offering at due.com. Great article and good information! I wish there was a tool like this when we were first starting out. Having to learn the ins and outs of Quickbooks while finding the next job can be really stressful. I think a lot of entrepreneurs would be interested in a simple tool like Due.com that allows users to gradually grow into a full-blown accounting system. For only $100 a year, it is a lot cheaper than Quickbooks online and definitely cheaper than Quickbooks Pro. Thanks, Pete. Yes, Due.com is much easier to use than Quickbooks. Will you still be using Quickbooks and integrating with Due.com, do you think? Another thing that people need to keep in mind, when comparing Due.com and Quickbooks Pro, on the pricing factor alone, is the one time cost of Quickbooks Pro versus the annual cost of Due.com. However, that said, there seems to always be a functionality aspect that requires an upgrade of Quickbooks Pro, so if people were to compare the two, they should probably calculate an upgrade cost for Quickbooks Pro that occurs at least once every three years.